Don't see your question answered below? Reach out to us or our selected installers and we'll get back to you as soon as we can. What was HeatSmart Bolton/Harvard and who is organizing it? How did HeatSmart Bolton/Harvard work? How did HeatSmart Bolton/Harvard offer a discounted price? How were the HeatSmart Bolton/Harvard installers selected? Will I be able to participate in the future? Why are prices increasing for contracts signed after July 31? Is participation in this program limited to Bolton/Harvard residents? What is clean heating and cooling and what technologies is HeatSmart Bolton/Harvard offering? 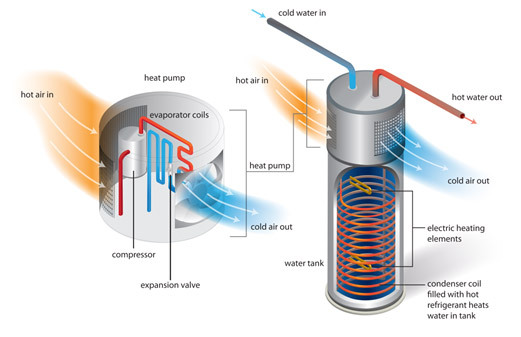 What is an air source heat pump and how does it work? What are the benefits of using an air source heat pump? Don’t air-source heat pumps perform poorly in cold climates? Are there other drawbacks to air source heat pumps? Why are air source heat pumps considered “clean heating and cooling” technologies? How efficient are air source heat pumps? How do the annual maintenance costs of an air source heat pump compare to other heating systems? How long do air source heat pumps last? How noisy are air source heat pumps? Can air source heat pumps provide hot water? How complicated is installing a heat pump and how much time will it take? How can I maximize energy savings from my heat pump? How well do air source heat pumps work in the middle of winter? Does it matter whether I have ductwork or not? Is a ducted or ductless air source heat pump solution is right for me? My home generates hot water via the boiler, has forced hot water heating, and multiple heating zones. Is a heat pump compatible with my home? Will we be able to select the type of units and their location in our homes? We’ve had power outages and expect more. What size generator would be needed to run an ASHP system? Can this be divided by load into a compressor load and then a head-unit multiplier? Will I need an electrical service upgrade? What if I don't have a lot of yard space or don't want to excavate?? 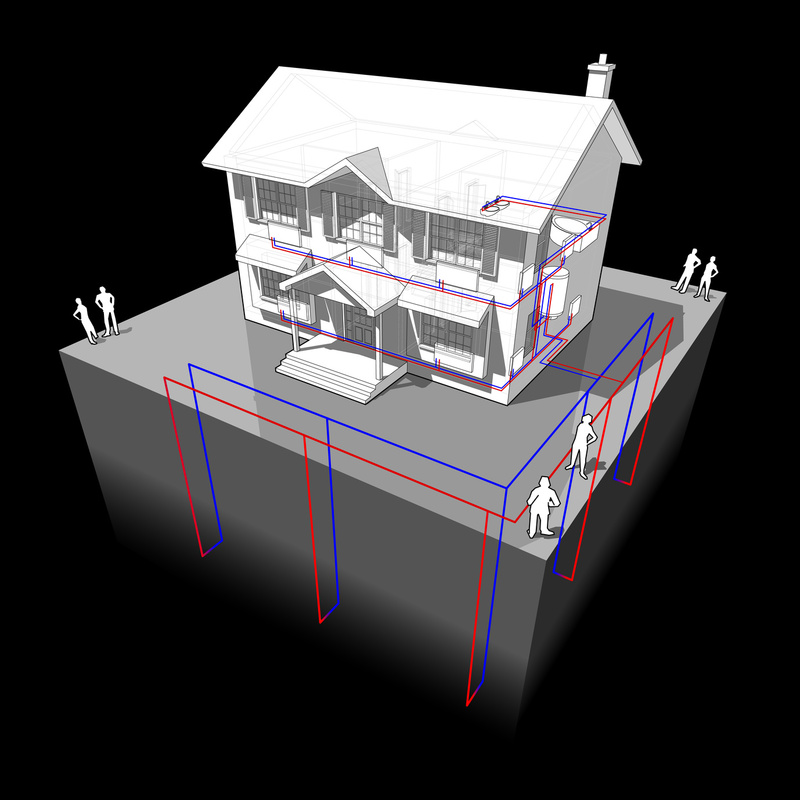 How well do geothermal heat pumps work in the middle of winter? Can a GSHP well take advantage of a pond or other body of water that is on or borders my property? How far away from the home can the ground source collection system be located? Are there well drilling and piping cost differences for the various well types? We’ve had power outages and expect more. What size generator would be needed to run an GSHP system? What is a heat pump water heater and how does it work? Is a heat pump water heater right for me? What rebates and incentives are available to me? Are these rebates and financing options available for new construction projects? How much could I potentially save by installing clean heating and cooling? How much can I expect to pay for a clean heating and cooling system? What happens when electric prices are high like they are this winter? What happens if electric prices rise considerably faster than oil, natural gas, or wood prices? Do the rebates go to the customer or the installer? Who will be applying for the rebates and HEAT Loans? What was HeatSmart Bolton/Harvard and who organized it? HeatSmart Bolton/Harvard was a community-based education and group purchasing program for clean heating and cooling technologies. HeatSmart Bolton/Harvard offered residents and businesses the opportunity to reduce their greenhouse gas emissions from heating and cooling by adopting advanced air-source and ground-source (geothermal) heat pumps at a discount from the regional average. From end of February through July of 2018, residents and businesses in Bolton and Harvard were able to purchase these selected technologies at a special, limited-time discount from co mpetitively-selected installers. Throughout the duration of this program, HeatSmart Bolton/Harvard offered educational “meet the installer” and open house events. HeatSmart Bolton/Harvard was the latest community-driven, town-sponsored clean energy initiative. HeatSmart Bolton/Harvard is led by a team of volunteer residents from the three towns with support from the town representatives. HeatSmart Bolton/Harvard was a pilot program through HeatSmart Mass, a statewide program supported by the Massachusetts Clean Energy Center (MassCEC) and Massachusetts Department of Energy Resources (DOER). The HeatSmart Bolton/Harvard organizers also received technical support from the Cadmus Group, an international technical and strategic consulting firm that has supported clean energy development in Massachusetts for decades. Does the concept of HeatSmart Bolton/Harvard sound a bit familiar? It might: HeatSmart Bolton/Harvard was modeled after the successful Solarize and community-based solar programs hosted in Bolton (2016) and Harvard (2011) The HeatSmart Bolton/Harvard team, with support from MassCEC and other technical advisors, adapted the Solarize model to fit clean heating and cooling technologies..
HeatSmart Bolton/Harvard brought straightforward, hassle-free approach that made Solarize so popular in our towns. HeatSmart Bolton/Harvard offers an easy way to learn about and purchase clean heating and cooling technologies from some of the most qualified installers in the region. One of the goals of HeatSmart Bolton/Harvard was to offer transparent, discounted pricing to residents and businesses. Due to the high potential volume of leads concentrated in a small geographic area, HeatSmart Bolton/Harvard’s selected installers are able to get the best bulk pricing from their manufacturers and distributors and be more efficient with scheduling and coordinating personnel. In exchange, HeatSmart Bolton/Harvard has worked with these installers to ensure that they are passing their savings to HeatSmart customers. Installers evaluated for this program were asked to bid their best pricing, and these bids were benchmarked against regional and statewide average pricing information provided by MassCEC. Interested installers were invited to submit bids through a competitive, public request for proposals to participate in HeatSmart Bolton/Harvard (and the three other HeatSmart pilot communities: Carlisle/Concord/Lincoln, Great Barrington, and Nantucket) in November. In January, the HeatSmart Bolton/Harvard committee evaluated installer proposals with support from MassCEC and the Cadmus Group. Ultimately, the HeatSmart Bolton/Harvard team selected Boucher Energy Systems and Bill Wenzel Heating & AC based on several factors, including their experience with working with local homes and businesses, equipment installation expertise, strong record of customer service, experience with community education, and pricing proposals. HeatSmart Bolton/ Harvard is closed and there are not current plans to run a new round of the campaign for the foreseeable future. However, if you are interested in getting a site visit for clean heating and cooling, you are welcome to reach out to our selected installers for more information. There are other installers in your community who will also be eligible to install systems rebated through MassCEC’s program. Visit the MassCEC website for more information. While the special HeatSmart pricing will no longer be available, you will still be able to take advantage of any of the incentives and financing programs available through state and relevant utility programs.. In cold climates like Massachusetts, heating and cooling accounts for over 30% of the greenhouse gas emissions that contribute to climate change. Reducing emissions from heating and cooling will be necessary for the state to meet its legally-binding target of reducing emissions by 80% below 1990 levels by 2050. In 2014, the Commonwealth released a statewide strategy for increasing the adoption of clean heating & cooling (also known as “renewable thermal”) technologies. Clean heating and cooling (CH&C) describes high-efficiency heating and cooling technologies that can use thermal energy (or be powered by energy) derived from renewable sources--including the sun, air, earth, and sustainably-harvested bioenergy. Because of their importance to meeting our state climate goals, state and local governments and utilities across the state are offering thousands of dollars in incentives to support their adoption. HeatSmart Bolton/Harvard is offering three technologies: air source heat pumps, ground source (geothermal) heat pumps, and heat pump water heaters. There are other CH&C technologies available in other HeatSmart communities. Learn more about them here. Air source heat pumps (ASHP) are electric appliances that provide heating and cooling by moving heat into a building (for heating) or out of a building (for cooling). Heat pumps do not create heat like electric resistance heating or fossil fuel-fired heating systems; instead, they transfer heat from one place to another. ASHPs use the outdoor air as a source (or sink) of heat, while ground source (or geothermal) heat pumps use the ground as a source (or sink) of heat. They accomplish heat transfer by using a refrigerant that absorbs heat from colder air in order to move that heat into a space with warmer air—much the same way that a refrigerator or air conditioner works except that it can move heat in either direction to provide heating or cooling. Ductless air source heat pumps are exactly as they sound: heat pumps that don't require that you have ductwork in your home to provide heating and air conditioning. Each ductless system includes one outdoor unit connected to one (single-zone) or more (multi-zone) indoor wall, floor or ceiling air distribution units. Ductless ASHPs are often referred to as ductless mini-splits, and systems with multiple indoor units are often called "multi-splits." Ductless air source heat pumps are the most efficient air-source systems and can be installed as a primary source of heating and cooling or installed to supplement existing systems. These supplemental applications could include, for example, installing ductless units in the most frequently used rooms like family rooms or master bedrooms to displace heating or cooling from your existing system, or placing ductless units in rooms or new additions that never seem to be warm or cool enough. These systems often come with remote controls that allow you to use them for heating, cooling, dehumidification or as a ceiling fan. Because each indoor unit can be controlled individually—forming an independent heating/cooling "zone"—you can reduce your energy use even more by lowering the temperature when heating (or raising it when cooling) in zones that are not being used. Ducted air source heat pumps have an outdoor unit that is connected to a building's ductwork, which is used to distribute heating or air conditioning throughout the building. Ducted (also known as central) ASHPs are not much different from central air conditioners or furnaces, except that they provide heating and cooling in a single system. Ducted ASHPs can work with your home’s existing ductwork, though some modifications may be necessary to adapt it from being suited for a furnace to being suited for a heat pump. If your home already has central air conditioning or an older ASHP, the ducts are more likely to be large enough to support a central ducted heat pump. Regardless of whether a system is ductless or ducted, all ASHPs will have an outdoor unit (pictured below), which will be mounted on a ground platform or on the side or roof of your building (to avoid snow buildup). The outdoor unit may also be located under a deck or overhang to keep snow off. This outdoor unit will be connected to one or more indoor air distribution units. If you’re installing a ducted ASHP, this will be a central air handler similar to one used by a furnace or central AC system. If you’re installing a ductless ASHP, this will typically be a wall-mounted unit (pictured below). Energy savings. If you heat with oil, propane, or electric resistance heat, you could save hundreds of dollars a year on your heating bill by installing an air source heat pump. No need to pay thousands of dollars to get a gas connection to your home: a cleaner alternative is already available. High-efficiency cooling, no ductwork required. 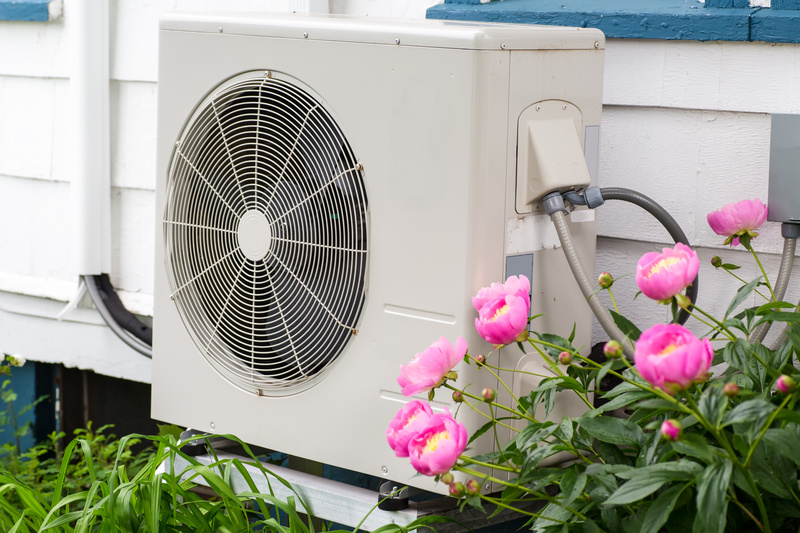 Air source heat pumps also provide air conditioning or dehumidification and are more efficient and much quieter than window air conditioners, since the noisy compressor is in the outdoor unit instead of attached to the window unit. Ductless ASHPs can allow you to reclaim your windows and avoid having to install ductwork to stay comfortable in the summer. Improved home comfort and health. In addition to providing cooling, heat pumps filter and dehumidify air, which can improve the air quality and comfort of your home. In particular, the filtration provided by ductless systems can significantly reduce allergens in your home for sensitive individuals. Central AC handlers have room for a variety of optional air quality improving devices, including electrostatic filters, UV filters, humidifiers, and heat recovery ventilators. Flexible options. Heat pumps are a flexible technology that can be installed in homes of all shapes and sizes with different needs—whether you need a whole-home system replacement, have (or don’t have) ductwork, want to add zoning to your home, want to increase the efficiency of heating part of your home, or want to add extra heating/cooling to that part of your home which is never as comfortable as it should be. Lower your carbon footprint. As a clean heating and cooling technology, converting from burning fossil fuels to using an air source heat pump will help reduce your carbon footprint and dependence on imported fossil fuels. Using solar PV or other renewable electricity sources can further offset emissions from the electricity powering your heat pump. Increased resiliency. Efficiently cooling even one room in a home may be a life-saver for people vulnerable to excessively high temperatures during heat waves. Traditional central ducted ASHPs are known for their poor cold-climate performance: these systems have been primarily used in the South for decades and are optimized for a warmer climate where air conditioning needs dominate. There are still some of these units operational in New England. If you have a central air source heat pump that is at least 12 years old, consider signing up for a site visit to explore a newer unit with better cold weather performance (and Mass Save will give you a larger "early replacement" rebate as well!). Modern cold climate central ASHPs have adopted many of the latest technological improvements, including variable speed compressors and fans that have been very successful around the world in ductless systems. The ASHPs installed through HeatSmart Bolton/Harvard are cutting-edge cold-climate models that are optimized for New England weather. These cold climate ASHPs are certified based on their performance at 5°F and can continue providing heat even when winter air is well below zero: today’s cold climate ductless heat pumps can extract heat from the air all the way down to -13°F. Concerned about heat pump performance in January? Don't be: Mainers and Vermonters have installed the most cold-climate heat pumps out of any New England state in the past few years—over 30,000 since 2013, and both states are significantly colder than Massachusetts in the winter! Are there drawbacks to air source heat pumps? Performance in extreme cold. Since ASHPs rely on extracting heat from the outdoor air, the heating output and efficiency of ASHPs declines as outdoor air temperature declines. While the cold climate ASHPs installed through HeatSmart Bolton/Harvard are rated based on their performance at 5°F, for many homes, most installers will recommend keeping a backup system (your existing system or added electric baseboards) for the coldest days of the year. During some of those particularly cold days, it may make more economic sense for you to shut off your ASHP and use your backup fossil fuel system to provide heating. It’s worth noting that it’s unlikely your ASHP will stop providing heat entirely: even in the prolonged cold snap in January 2018, the temperature (not wind chill) did not drop below -13F. Heating performance in high humidity. During periods of high humidity, frost can form on the outdoor unit, which can obstruct airflow. ASHPs detect this occurring and initiate a defrost cycle. This cycle requires additional energy due to the system running in reverse to defrost (and for ducted systems, through using a built-in electric resistance element) that reduces overall efficiency. In spite of this, ASHPs are still very efficient: the Bolton Coach's central ASHP system's resistive heater for backup heating and defrost accounted for 30% of energy usage, though the system still maintained excellent performance, achieving a seasonal efficiency of 270% (seasonal COP of 2.7). GSHPs inherently avoid defrosting completely. Aesthetic considerations. ASHPs require outdoor units and piping, and indoor equipment (wall-mounted units) may be aesthetically displeasing to some homeowners. Your installer can discuss a variety of options available to you to minimize aesthetic impacts from an ASHP installation. Higher installed costs. ASHPs cost more upfront than fossil fuel or central AC systems. However, their higher efficiency will typically pay back the difference over the course of several years. Lower efficiency than GSHPs. Since the outdoor air is more variable in temperature than the ground and given the need for defrost cycles, ASHPs are typically less efficient than geothermal heat pumps. However, ASHPs are also cheaper and quicker to install. Is your existing heating or air conditioning system (or older ASHP system) 15+ years old? Do you want central air conditioning but don’t have/don’t want to install ductwork? Do you have persistent hot or cold spots in your home? Do you want more control over the temperature in individual rooms in your home? Are you sensitive to air pollutants and allergens? Do you want to reduce your carbon footprint? Air source heat pumps are considered to be “clean” heating and cooling systems because they do not create heat, but rather they move heat from the ambient air from one place to another. This process is powered by electricity, which can also be sourced from renewable sources like solar, wind, or hydro. **Based on calculations from EPA eGrid data, ISO-NE emissions data, and DOER guidelines. ASHPs are typically rated for heating efficiency based on their Heating Seasonal Performance Factor (HSPF) or seasonal Coefficient of Performance (COP), both of which describe the system’s efficiency over the course of the heating season. The seasonal efficiency of ASHPs can range from 220% to 300%+ (i.e. COP of 2.2 to 3.0) depending on the system type, application, and how cold it is outside. That means that for every one unit of electricity used, 2.2 to 3 units of heat are transferred into the home. By comparison, electric resistance heating has a COP of 1, and fossil fuel boilers and furnaces can be 75-95% efficient. The Bolton Coach's ducted ASHP system achieved a COP of 2.7 during 2017 even when accounting for added energy costs for defrosting. ASHPs also provide high-efficiency cooling—better than window AC units and comparable to the highest-efficiency central air conditioners. Less than half of homes in Bolton and Harvard have central air conditioning and the necessary ductwork, so ductless ASHPs can allow you to cool your home very efficiently without installing ductwork or sacrificing your windows! How do the maintenance requirements and costs of an air source heat pump compare to other heating systems? Annual system maintenance, which consists of cleaning air filters and an annual maintenance checkup for the outside unit, costs about the same as annual servicing charges for a boiler or furnace. You can also clean or replace the filters yourself, which can help to keep your system running well for many years (ask an installer for tips on how best to do this!). Otherwise, the only other maintenance requirement would be to keep your outdoor unit clear of snow during the winter, just like you would need to keep your furnace or boiler vents clear. How long do air source heat pumps last? 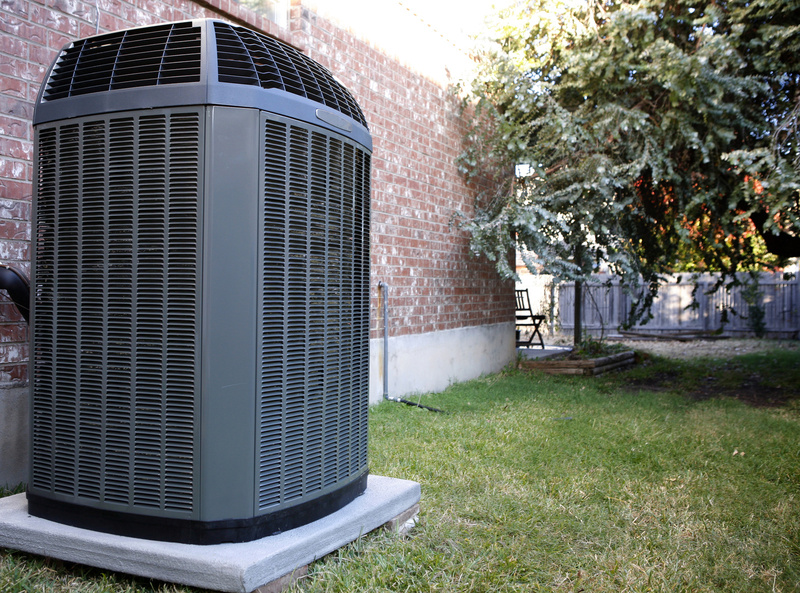 Heat pumps have an expected lifetime of about 15 years—similar to the average furnace or central AC system. How noisy are air source heat pumps? A ductless ASHP indoor unit is quieter when running than a refrigerator and much quieter than a typical window AC unit. 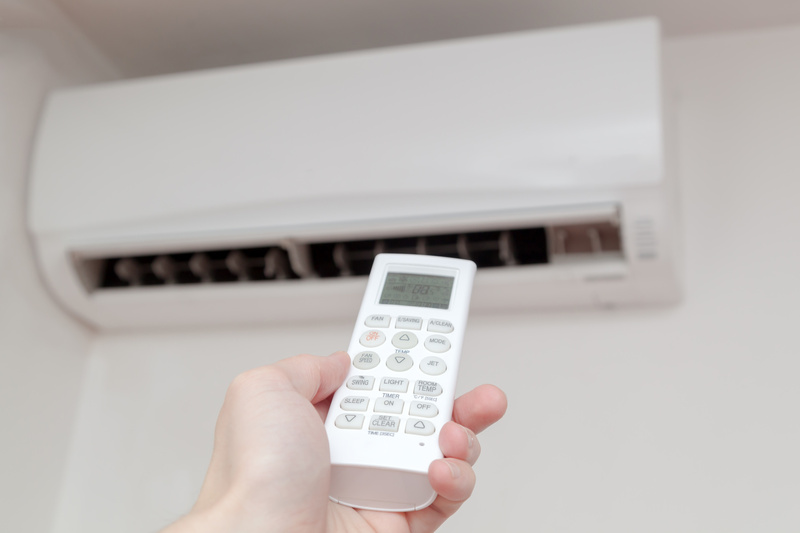 Ducted ASHPs are no louder than a central air conditioner and much quieter (and less odorous!) than a roaring oil furnace. Can air source heat pumps integrate with hot water distribution systems? Can they provide domestic hot water? Through the HeatSmart program, all of the interior units are designed to be compatible with forced hot air systems, or work on a stand-alone (ductless) basis. This program does not offer interior units that are compatible with hot water heating systems, and the few units that are commercially available in the U.S. at this time are not eligible for state incentive programs (and may only work with some lower-temperature hot water systems). There are water heaters that use heat pump technology to provide domestic hot water. Heat pump water heaters (HPWHs) are considered to be different technologies from ASHPs and are not included in the special HeatSmart Bolton/Harvard offer. However, many installers offer HPWHs and can provide you with more information when they come for a site visit. Learn more about heat pump water heaters here. A heat pump installation is typically a straightforward process with minimal disruption to your home. A simple, single-zone ductless ASHP mini-split system can be completed in less than a day and only requires a single 2-3 inch hole to be cut (and later, sealed) in your wall. If you are installing a “multi-zone” ductless system or a ducted system that requires modifications to your ductwork, your installation may take a few days or more to complete. “Set it and forget it.” While many of us are used to turning off the lights and turning down the heat when you leave the home or go to sleep, heat pumps are most efficient when running continuously at partial output without sudden increases in heating demand from cranking the thermostat up. Think about it like how your car’s mileage improves when you drive at a constant speed instead of constantly stopping and starting. Consider only setting back your heat pump system when you’re gone for several days. Heat pump systems can be wirelessly controlled, so when you're on your way home you can adjust your thermostat from your smartphone and bring your home back up to the perfect temperature when you arrive. Know when to use your backup system. Depending on the weather and the cost of your backup heating fuel, it may be more efficient to use your backup system during the coldest parts of the year when heat pumps are at their least efficient. If you expect the temperature to be in the single digits or lower for the day, consider just turning your heat pump system off and firing up your backup boiler or furnace. Keep your system well-maintained. A well-maintained system will keep performing at high efficiency. Remember to clean your indoor dust filters; keep the outdoor condenser free of snow, ice, and other obstructions; and get regular annual servicing. Improve the efficiency of your home. A heat pump in a well-insulated home will perform better than in a poorly-insulated home. Consider getting approved, incentivized insulation, air sealing, and weatherization upgrades through Mass Save prior to installing your heat pump. Not only will your home be even more comfortable and your system perform better, but you may need a smaller (and cheaper) system to meet your home’s needs. Quite well! As mentioned above, HeatSmart Bolton/Harvard is only offering cold climate air source heat pumps that are certified for their performance at 5F and can operate at temperatures down to -13F. Air source heat pumps do lose efficiency as it gets colder, so as the temperature drops into the teens and single digits, you may want to consider using your backup fossil fuel heating system. You will also want to keep your outdoor condenser unit clear to maintain airflow and minimize defrosting necessary (which reduces heating output and efficiency). While the installer will mount it on a ground platform or on the side of your wall, you’ll want to keep the area around the condenser free of snow--just like keeping your furnace/boiler vents clear during snowstorms! While traditional heat pumps (and electric heating in general) have a bad reputation in New England, look no further than Maine and Vermont, where over 30,000 homeowners have installed ductless ASHPs in the last five years! Do you have poorly sized ducts or inadequate heating/cooling to particular areas of your home? Ductless systems could help you address those hot and cold spots in a less invasive/costly manner than making significant ductwork modifications. Do you have/are you planning a new addition? 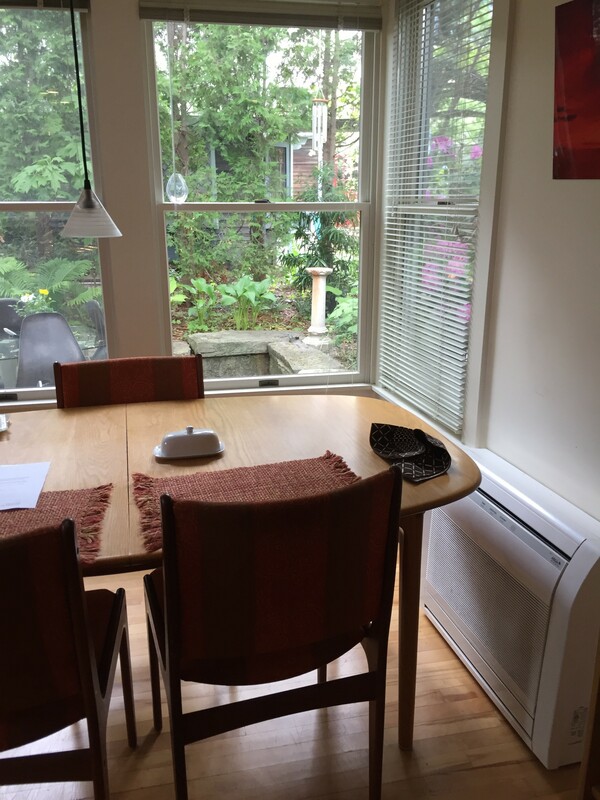 A ductless system could be a cheaper solution than extending ductwork to the addition. Do you want to add zoning for heating and cooling in your home? Many installers can modify your ductwork and install ductless units to give you more control over zoning in your home. Is modifying ductwork in your home very difficult (or are you concerned about the invasiveness of ductwork modification)? Ductless systems could offer you the benefits of switching to a heat pump without necessitating an extensive ductwork retrofit. As you can see, every home is different and the suitability of one option or the other may change once the installer does a walkthrough and learns more about your needs and interests. We strongly suggest that you speak with our ASHP installer Boucher Energy Systems, who can install both types of systems and will make a recommendation that best suits your specific needs. My home generates hot water via the boiler, has forced hot water heating, and multiple heating zones. Is a heat pump compatible with my home? Yes, there are a variety of applications in which ductless heat pumps could work well for homes that already have have a zoned hot water distribution system. Ductless heat pumps could work to displace heating from one or more zones or serve as a primary heating system with indoor units installed across all of your zones. Speak with our ASHP installer, Boucher Energy Systems for more information--and get a free site visit so they can learn more about what solution would be best for your needs. Will we be able to select the type of units and their location in our homes? Yes, there are a variety of indoor units that can be used in different locations around your home, including wall-mounts (in different colors), floor-mounts, ceiling cassettes, and central and "mini" ducted units. However, realize that the efficiency of the system may vary according to the placement of the units and the type of unit selected. Boucher Energy Systems will tailor each quoted system to your specific needs and configuration. The generator size needed would vary based on the heat pump system size--potentially starting at 3 kW for a small mini-split ASHP and going up to 10kW or more for a larger system. Consult Boucher for more information on what may be needed for your system. The power consumption of the Bolton Coach's 3-ton central system can use up to 9 kW due to resistive heating elements. However, using the air handler fan only require about 380W. Thus in the event of a power outage, the ASHP can be put into fan-only mode and powered from the generator to circulate hot air from a backup central wood stove. If you're concerned about power outages affecting your heating systems, remember that boilers and furnaces also need electricity to run as well! Will I need an electrical service upgrade? If you have 100Amp electrical service, you will likely need an upgrade. If you already know what your home's electrical service capacity is, ask Boucher about it when they call you to schedule a free site visit. Heat pumps do not create heat like electric resistance heating or like fossil fuel-fired heating systems; instead, they transfer heat from one place to another--much the same way that a refrigerator or air conditioner works except that it can move heat in either directions to provide heating or cooling. Ground source (or geothermal) heat pumps use the ground as a source (or sink) of heat, while air source heat pumps use the outdoor air. Geothermal heat pumps accomplish this by running water through piping (“ground loop”) buried in the ground and using an indoor heat pump unit to extract heat from this water. The indoor heat pump unit will then circulate this heat through your building like a traditional heating system. In the summer, this process is reversed and heat from your home is transferred into the ground. Closed loops use a continuous loop of buried piping, typically made out of high density polyethylene. A closed loop system will circulate a mixture of water and environmentally-friendly antifreeze that is not directly exposed to the environment. Most closed loop systems are installed in vertical configurations, in which the ground loop is run through multiple boreholes that are drilled several hundred feet deep into the ground (see below). Some closed loop systems are installed in horizontal configurations, in which the ground loop is run through multiple trenches approximately 5 ft deep and around 300-400 feet long. Most systems installed in Massachusetts are vertical closed loop systems (see below). A water-to-air system connects your indoor heat pump to a central air handler and uses your home’s existing ductwork to distribute heating and cooling throughout the home. Some modifications to your ductwork may be necessary to make it suitable for a geothermal system. If your home already has central AC or an older heat pump, your ducts are more likely to be large enough to support a GSHP with fewer modifications. A water-to-water system connects your heat pump to your existing hot water distribution system to provide heating. Note that the temperature of water heated by a GSHP is lower than required for higher temperature hot water distribution systems, so replacement may be necessary. An air handler (and ductwork) would be necessary to provide air conditioning. A clean, whole-home solution. Geothermal can offer a clean whole-home heating and cooling solution without requiring backup heating. Eliminate fossil fuel combustion and associated risks from your home entirely. 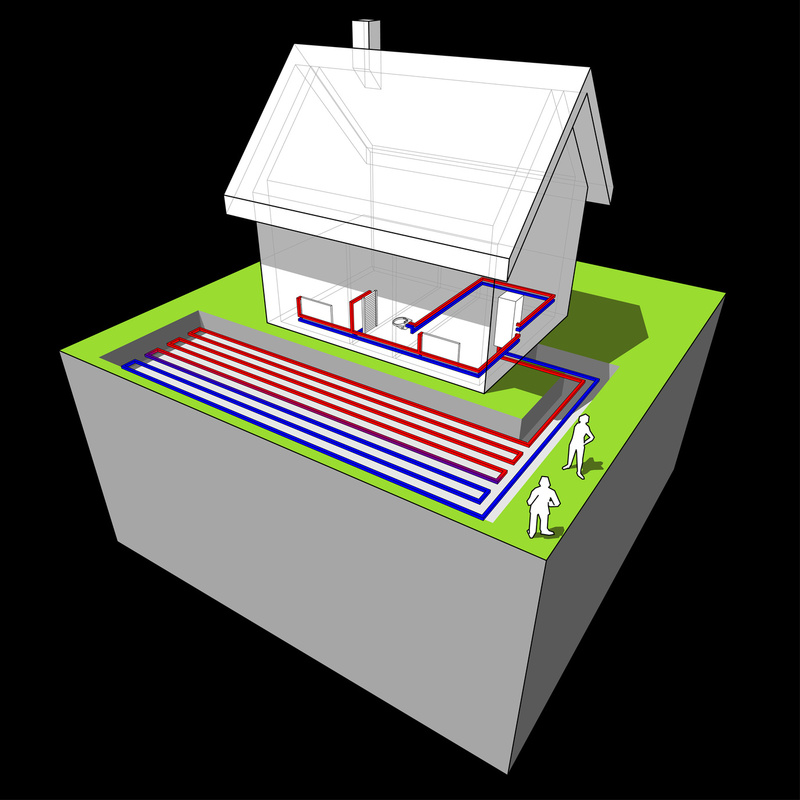 Geothermal can also heat 40-50% of your home’s hot water at no additional operating cost with an add-on. Improved home comfort and health. In addition to providing cooling, heat pumps filter and dehumidify air, which can improve the air quality and comfort of your home. In particular, the filtration can significantly reduce allergens in your home for sensitive individuals. GSHP air handlers have room for a variety of optional air quality improving devices, including electrostatic filters, UV filters, humidifiers, and heat recovery ventilators. No exposed outdoor components. If you are concerned about outdoor aesthetics, all outdoor components of a geothermal system will be buried underground (compared to central air conditioners and air source heat pumps). Remote maintenance. Bill Wenzel can offer ground source heat pumps from WaterFurance with the Symphony monitoring system installed. This will allow Bill Wenzel to receive alerts, diagnose errors, and perform maintenance remotely, only needing to come out to your home when hands-on maintenance is required. No defrost cycles. GSHP are not vulnerable to atmospheric conditions because they use the Earth directly and thus do not have defrost cycles like ASHP systems do. This inherent feature of GSHP makes them more efficient throughout the winter and quieter outdoors than ASHP. High upfront costs. GSHPs are very expensive to install, with most systems costing around $20,000 after incentives to install. While their significant energy savings pay for themselves, they can take several years to pay back the difference compared to traditional fossil fuel or central AC systems. Landscaping considerations. GSHP systems do require drilling or excavation in your yard. Vertical loop systems require the least disruption to your property, though there will still be some disturbance associated with the drilling process and moving drilling equipment around. Ask Bill Wenzel about what options there are for minimizing disruptions and restoring landscaping after installation. Ductwork installation or modification may be required. Geothermal systems can offer both heating and cooling, but there can be some limitations to what existing distribution systems a GSHP system will work with. While geothermal heat pumps can work with low-temperature hot water distribution systems, they are not able to provide enough heat for steam or more common high-temperature water heating systems. In that case, ductwork may need to be added for your geothermal system to provide air conditioning. Even if you already have ducts, some modifications may be necessary to adapt your ductwork from being designed for furnaces to being designed for geothermal. If your home already has central air or an older heat pump, these ducts are more likely to be large enough to support a GSHP system with fewer modifications. Are you concerned about aesthetic disruptions to your home? Is your boiler/furnace, central AC system, or existing heat pump system 15+ years old? **Based on calculations from EPA eGrid data, ISO-NE data, and DOER guidelines. Yes. Geothermal systems can be installed with desuperheaters that can provide you with about half of your home’s annual hot water needs. 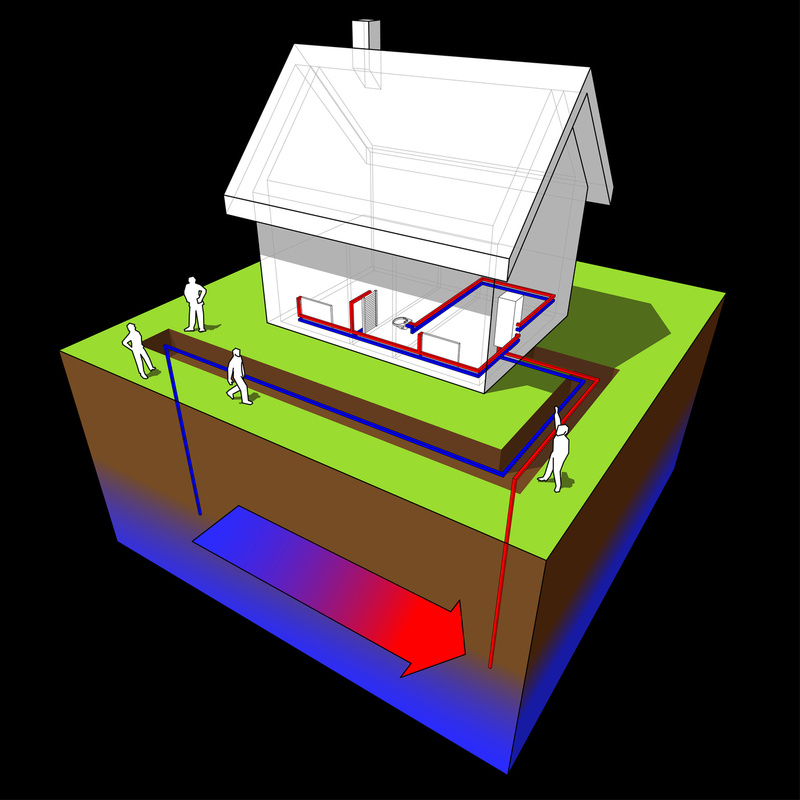 A geothermal system operating in cooling mode will typically store unwanted heat in the ground. A desuperheater will use that waste heat to pre-heat your hot water before it enters your hot water heater. Speak with our installer Bill Wenzel about whether a desuperheater add-on will be a good solution for your home. Desuperheaters can work with heat pump water heaters as well as other water heaters, and Bill Wenzel can work will work with plumbers to connect this to a new heat pump water heater installation. How do the annual maintenance costs of geothermal heat pumps compare to other heating systems? Geothermal systems do not have higher maintenance requirements than traditional heating and cooling systems, though annual maintenance is recommended to ensure that it functions well over the course of its lifetime. The ground loop is designed to last for up to 50 years or more, and no other components are exposed to the elements. The indoor geothermal heat pump unit is warrantied for up to 11 years. How long do geothermal heat pumps last? The ground loop piping is designed to last for up to 50 years or more. The indoor heat pump unit has a life expectancy of around 20 years, similar to conventional heating and cooling systems. Some pumps, controllers, or other components may require replacement sooner than the indoor unit. Open loop (standing column) systems may need more frequent service and replacement of submersible pumps, depending on the local water chemistry. Our installer Bill Wenzel will visit your home within 2 weeks of you signing up for a site visit. If geothermal is suitable for your home, Bill Wenzel will present you with a customer proposal within a week of your site visit. A geothermal installation will typically take 2-3 months to complete from when you sign a contract. This includes obtaining rebate preapproval; ordering and delivery of equipment; drilling/excavation, installation, and commissioning of the system; and inspection of the completed installation. What if I don’t have a lot of yard space? You only need a lot of space for a horizontal ground loop installation. A vertical closed-loop system will require only a few small boreholes and can take up as little space as two parking spots. Very well, as the earth maintains a more consistent temperature throughout the winter than the air. As a result, geothermal heat pumps will perform better than air source heat pumps during the coldest parts of winter. In addition, GSHP systems are not exposed to atmospheric conditions and thus do not need to perform more wasteful defrost cycles as with ASHP systems. Near the end of winter, efficiency may be reduced slightly as the temperature of the ground has dropped. While air source heat pumps can perform well in cold climates, if you want a central heating and cooling system with stronger year-round performance, geothermal may be a better fit for you. Can a GSHP well take advantage of a pond or other body of water that is on or borders my property? If the body of water is entirely contained within your property line, you may be able to incorporate it into the ground-loop. The pond could potentially be used as your heat transfer medium, depending on the size and depth (at least 8 feet). Any piping installed in a pond or within 100ft or a wetland or pond is subject to approval by the local Conservation Commission and will likely need approval prior to installation even if the pond is completely contained on private property. How far away from the home can the ground source collection system be located? The typical limit is 100 feet. It must be at least 25 ft from a septic system and 50 ft from a domestic water well. Are there well drilling and piping cost differences for the various well types? Standing column wells are generally cheaper because less drilling depth is needed per ton of capacity of your heat pump (approx. 100 feet per ton). A vertical closed loop system will require more bore depth (approx. 150 feet per ton). While standing column well systems can be cheaper upfront, they also have the added cost of a submersible pump and power line—and because the pump needs to pump water up hundreds of feet, the pump will use more energy and need to be replaced more frequently than a closed loop pump. Speak with your installer, as each GSHP system is customized for your home. It is worth noting that furnaces and boilers also require electricity to run, so an alternative for a backup generator for extended power outages could include a wood or pellet stove. A typical air-handler fan needs less than 500 W, thus in the event of a power outage, the GSHP could be put in a fan-only mode and powered from the generator to circulate hot air from a central wood stove or other backup heater. Heat pump water heaters also use heat pump technology to transfer heat from one place to another. Unlike air and ground source heat pumps, which are used to heat and cool the air in your home, heat pump water heaters extract heat from the air and moves it into a tank to heat water. As a result, heat pump water heaters are 2-3 times more efficient than electric resistance water heaters. As shown in the diagram below from the ENERGY STAR website, most heat pump water heaters differ from air source heat pumps in that all of the heat pump elements are indoor and combined with the storage tank. Most heat pump water heaters are “hybrid” heat pump water heaters and also include conventional electric resistance heating elements to provide backup heating when hot water demand is high. Energy savings. If you use an electric resistance tank to heat your water, a heat pump water heater will cut your water heating bill in half or more (and reduce your carbon footprint too!). You can also save on your water heating bill if you use an oil or propane water heater. Depending on your hot water usage, this could amount to up to $200 in energy savings a year or more! The Bolton Coach recorded his water heater power consumption over more than a year after he replaced his conventional 115-gallon electric water heater with a 66 gallon HPWH. The HPWH heater reduced power daily power consumption from 8kWh to 3 kWh, thus the system was over 260% more efficient (COP of 2.6). This saved him 1,825 kWh over the course of the year or nearly $400—not including the savings from no longer having to run his dehumidifier. During the winter, the cool dry air from his HPWH is directed outside through ducting. Dehumidification. Humidity can be a problem in many basements in Massachusetts. A heat pump water heater will dehumidify whatever space it's in, greatly reducing the need to run a dehumidifier in your basement. Noise. Since the heat pump compressor is located inside your home instead of outdoors, a heat pump water heater will be noisier than a typical water heater—more similar to a window air conditioning unit. Speak with Boucher if you are sensitive to noise and vibration to learn more about your options. Cooling effect. Most heat pump water heaters extract heat from indoor air. If placed within a finished space, the heat pump water heater will cool off the room it’s in. If placed in an unfinished space, it will keep that space quite cool throughout the year. While installing a heat pump water heater will typically still offer net energy savings, it will increase your space heating bill a bit to compensate—though on the flip side, it will cool and dehumidify in the summer! Manufacturers provide guidelines on room size as well as on ducting air in and out, if necessary. Higher upfront cost. Heat pump water heaters are more efficient than traditional water heaters but will cost more upfront than a typical electric water heater. However, their energy savings will pay for the difference in cost--and if you're replacing an electric water heater, you'll get additional rebates from Mass Save to help to offset the added cost as well. Do you use an electric resistance, oil, or propane water heater? A heat pump water heater could be an excellent investment for you if you currently are using a non-gas water heater. The savings from going from an electric resistance tank to a heat pump water heater and available rebates will offset the added upfront and pay back your investment over the course of several years. Do you have a partially finished or unfinished basement with enough clearance? Heat pump water heaters are a bit taller than most traditional hot water heaters and need sufficient airflow to operate at highest efficiency. Additionally, they should ideally be placed in an unfinished space to maximize the amount of heat extracted from the ground and not from heat provided by your heating system. If you have enough space next to your furnace, a heat pump water heater will be able to take advantage of the waste heat generated by your furnace. A free site visit from Boucher can help you figure out whether a heat pump water heater is right for you. We've also pulled together a guide to heat pump water heaters, which includes more details on the benefits of HPWHs, detailed energy and cost data from Bolton Coach Tony Jagodnik's experience with his own HPWH, and steps on how best to select a HPWH model that meets your needs. Check out our guide here. This guide also references a list of Mass Save rebate-eligible HPWH models, as well as which of these models are offered by other local HPWH installers. Download the spreadsheet here. Information on how to utilize this spreadsheet is provided in the guide. There are a variety of incentives available for clean heating and cooling offered by the Massachusetts Clean Energy Center, Dept. of Energy Resources, and Mass Save. Consult the HeatSmart Bolton/Harvard rebates and financing guide for a description of these rebates and special requirements. MassCEC Clean Heating and Cooling Program. The MassCEC Clean Heating and Cooling Program provides rebates for the technologies offered by HeatSmart Bolton/Harvard. These rebates vary based on the technology, but you should expect to receive rebates of approximately 15-40% depending on the technology, with ASHPs receiving the smallest rebates and GSHP receiving larger rebates. Mass Save. Mass Save offers rebates for ASHPs and HPWHs only. For ASHPs, this rebate can range from $250-500 for a ducted system to $200-800+ for a ductless system (depending on the number of indoor units installed and whether you’re replacing electric resistance heat). For HPWHs, the rebate is only available when replacing an electric storage water heater (not tankless/on-demand) and will be $150 or $750 depending on the size of your hot water heater. If you're replacing an old central ASHP with another central ASHP, you can get an extra incentive if the system is at least 12 years old. Massachusetts Sales Tax Exemption. Geothermal heat pumps are exempt from the MA sales tax under MGL 64H.6(dd). Federal Investment Tax Credit (NEW!) In the spending bill passed February 9, 2018, Congress reinstated the federal renewable energy investment tax credit for geothermal that previously lapsed at the end of 2016. Retroactive to the start of 2017, homeowners will be able to claim a tax credit of up to 30% of the cost of a geothermal system. Alternative Energy Credits. The Commonwealth’s Alternative Portfolio Standard awards Alternative Energy Certificates (AECs) to owners of clean heating & cooling technologies. If you’re familiar with solar renewable energy credits (SRECs), AECs work very similarly in that they need to be purchased by electric utilities to meet increasing annual requirements for alternative energy and clean heating. While the program was only opened to clean heating and cooling in January 2018, these AECs are expected to be worth around $15-20 each, determined at a public auction held every quarter. The number of AECs you will receive varies by technology, as unlike with solar PV, there is no required metering of clean heating production for the technologies offered by HeatSmart Bolton/Harvard. Unlike SRECs, for air and ground source heat pumps you will receive 10 years worth of AECs upfront (more like an additional rebate) as opposed to quarterly over the life of the system. Similarly, you should expect to work with an aggregator, who will sell your credits in bulk during quarterly auctions on your behalf for a small fee. Note: While GSHP systems will be designed and installed to make sure you will receive the AECs, ASHP systems are unlikely to receive AECs unless you are installing a whole-home system without a backup. This application for ASHPs will only work for very well-insulated homes and will not likely be recommended by Boucher. The Mass Save HEAT Loan is available to residents of Bolton and Harvard. The HEAT Loan offers a 0% interest, 7-year loan of up to $25,000 and is available for all technologies offered through HeatSmart Bolton/Harvard. That equates to monthly payments of about $120 for a $10,000 system! Additional information on the requirements for air and ground source heat pumps and heat pump water heaters are provided below. Additional information can be found here. You can also combine multiple eligible improvements on one HEAT Loan (e.g. air source heat pumps + heat pump water heater + insulation and weatherization). You only get one HEAT Loan in total, so take advantage of this offer by financing as many eligible energy improvements as you're able! Some installers also offer some financing options through other banks--and your bank may also be able to offer you other lines of credit. Many of the incentives are available whether you're installing a heat pump system in an existing building or a new construction project. However, not all Mass Save programs are available to new construction projects—and there is also a special new construction available through Mass Save to support energy efficient new homes. Read our article here for more information. Everyone’s heating (and cooling) bill is different—so the amount you could save on energy will vary depending on a number of factors, including what fuel you currently use to heat your home, how well-insulated it is, what size and shape your home is, what temperature you keep your thermostat at, how many heat pump units you install (for ASHP), how you use the system, and more. Typically, the most important factor is what fuel you currently use to heat your home and how old and inefficient your heating system is. If you heat with oil, electric resistance, or propane, you’ll probably see the most energy savings—anywhere from $500 a year to over a $1,500, depending on how much you currently pay and how much of your heating bill you offset. If you’re already heating with gas, you will see very few savings from clean heating and cooling. Based on fuel prices today, heat pumps are significantly cheaper than propane and electric resistance. Air source and geothermal heat pumps are about 20% and 50% cheaper respectively to operate than oil, and only geothermal heat pumps are slightly cheaper than natural gas. Take a look at the chart below for a closer look. Typically an air source heat pump system will cost about $3,000-$3,500 after rebates for each zone (indoor unit) you install. A geothermal system will cost about $20,000 after rebates for a whole-home system. Historical average prices only show one side of story and misses the volatility in the market: for one, gas prices are currently at historical lows across the country, and oil prices spiked from nearly $4/gallon in 2014 to $2.20/gallon in 2016 and back to $3.10/gallon in January 2018. Electricity prices tend to be more stable because they are regulated by the state and fossil fuel prices are driven by costs on the open market. If you are concerned about oil prices dropping again, one option to consider would be to install an air source heat pump while keeping a backup oil system in place. 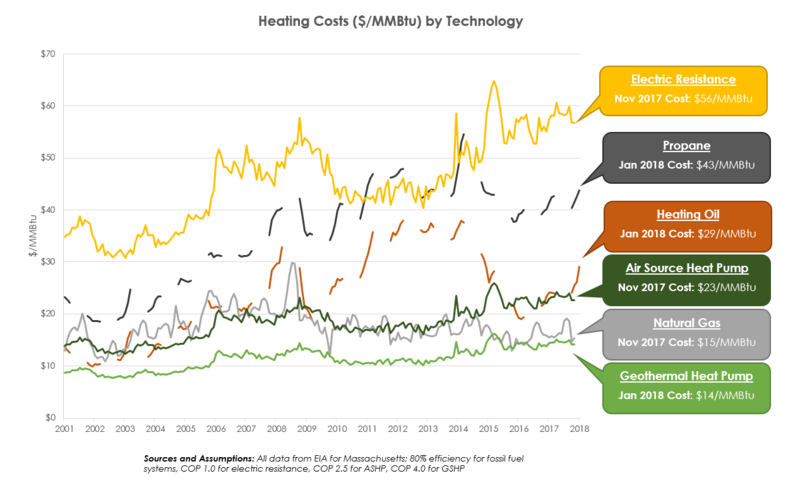 If oil prices collapse again, you can use your heat pump when it’s warmer (e.g. above 30F) and use your oil system when it’s coldest to maximize cost-savings. Do the rebates go to the customer or the installer? Who will be applying for the rebates and HEAT Loans? Many installers will apply for rebates on your behalf and help you fill out the HEAT Loan application. These rebates may not necessarily be deducted from the cost of the system and may be mailed to you directly. Are you ready to HeatSmart?